The Colegio Madre Antonia Cerini (Mother Antonia Cerini High School) was established in Medellín in 1961. The Hermanas de San Antonio de Padua (Sisters of St. Anthony of Padua) arrive in Colombia from Argentina establishing themselves first in Sutatenza, with their respective (Catholic) educational mission through the so called Acción Cultural Popular. Later they establish in late 1960 another education center in Medellín. The flag (of the Medellín High School) is seen here (it features the coat of arms on the flag in the middle). The symbols (flag and coat of arms) are explained here. Colegio Integrado Madre de la Esperanza (CIME) was established on 22 February 1971 in Sabana de Torres (Santander Department). In 1965, the school incorporated Escuela Juan José Rondón (est. in February 1968). Institución Educativa Colegio Integrado Madre de la Esperanza was established by Resolution No. 15,677, adopted on 31 December 2002. The flag of CIME is horizontally divided white-blue with the school's badge placed in upper fly. "Instituto Madre del Bon Consejo" is an "educative citadel" founded in 1972 by Mother Verónica Tejedor in Floridablanca, Department of Santander. Since 2003, the institute has been ruling four seats all located in Floridablanca, "Instituto Madre del Bon Consejo" (main seat), "Instituto Domigo Sabio", "Instituto Josefa del Castillo" and "Instituto El Progreso". 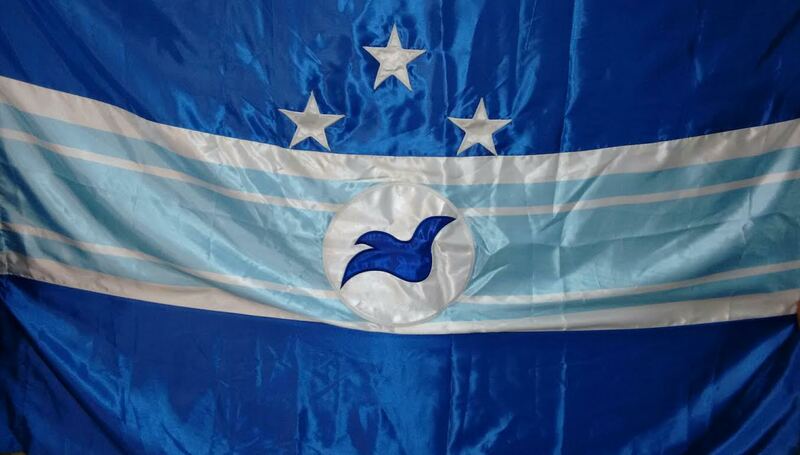 The flag of the institute, as shown graphically and described on the website of the institute, is vertically divided King blue-white, with the emblem of the institute in the upper left part of the white field, and five blue SW-NE diagonal stripes in the lower fly of the flag. Blue represents peace and harmony, and the diagonal stripes represent the ladder to excellence. The emblem of the institute is a shield with the name of the institute written in the border, the red letters "IMBC", a yellow book representing science, a football ball representing sports and a torch representing the flame of knowledge. "Gimnasio 'Madre de Trinidad de Calcuta'" is located at Alamos Norte, Bogotá. The flag of the institute, as shown graphically on the website of the institute, is horizontally divided green-white. Institución Educativa Maestro Pedro Nel Gómez was established in Florencia borough, part of the municipality of Medellín (Antioquia Department) by Resolution 16,210 of 27 November 2002, as the merger of Liceo Maestro Pedro Nel Gómez and Escuela Departamental Monseñor Diego María Gómez Tamayo. Liceo Maestro Pedro Nel Gómez was established in 1982 by Resolution No. 20,588 as the second seat of Institución Educativa Diego Echavarría Misas, and renamed institución Educativa Maestro Pedro Nel Gómez by Decree No. 2,663 of 8 July 1996 Escuela Departamental Monseñor Diego María Gómez Tamayo was established as Escuela Municipal No. 4 by Agreement No. 6 of 7 February 1964 and renamed Escuela Departamental Monseñor Diego María Gómez Tamayo by Resolution No. 102 of 12 February 1973. The institute is named for the artist Pedro Nel Gómez (1889-1984), considered as one of the most prolific South American muralists in the 20th century. The flag of the institute is horizontally divided ochre yellow-green with a red triangle placed along the hoist. The flag is a tribute to the work of Pedro Nel Gómez. Yellow is a symbol of nobleness, wealth, power, light, constancy, knowledge, and force. Green is a symbol of the exuberant environment of Antioquia represented in Pedro Nel Gómez' works, as a symbol of life, plenitude, and fresh and pure environment. Red is a symbol of light, force, and energy. The triangle is a symbol of the wisdom of Pedro Nel Gómez, who was a noted humanist, urbanist, muralist, painter, and sculptor. Escuela Normal Superior del Magdalena Medio, established in Puerto Berrío (Antioquia Department), started classes on 27 January 1997. Named Escuela Normal Consejo de Puerto Berrío by Agreement No. 8 of 11 August 1997, the institute was renamed Escuela Normal Superior del Magdalena Medio to emphasize its regional dimension. The flag of the institute is horizontally divided wine red-white-wine red with the institute's emblem in the middle. Wine red is a symbol of force, dedication, and commitment. White is a symbol of peace, noble aspirations, and transcendency. The emblem of the institute features a triangle inscribing a representation of the region; the triangle represents the pedagogic acts proper to the institute, its three sides symbolizing leisure, education, and science. The words "TRABAJO" (Work), "DISCIPLINA" (Discipline), and "SUPERACIÓN" (Surpassing) represent the attitude to be developed by the members of the educational community. Inside the triangle is represented river Magdalena, shaped with two letters "M" meaning "Magdalena Medio" (Middle Magdalena). The dark background surmounted by a red and yellow sun symbolizes the institute's vision as leadership, guide, and light for the educational development of the region. The sun is charged with a book inscribed with "HOMBRE NUEVOS" (New Men) and a torch representing the task to educate new teachers. The name derives from the Magdalena River course, and when it passes through Antioquia Department (where Puerto Berrío, the Municipality of this school is located) the river is in its middle course towards the Caribbean Sea into the Atlantic Ocean. "Universidad del Magdalena" was founded in Santa Marta in 1962. The flag of the university, as shown graphically on the university website, is horizontally divided, the upper stripe being golden yellow and the lower stripe vertically divided into two equal blue and red fields. The emblem of the university is placed in the middle of the flag. The emblem of the flag is a disk horizontally divided brown-blue with a four-directions rose wind overall, whose northern point ends in a vertically divided yellow-blue fleur-de-lis, and a golden bird in the upper part. I suspect that these colors are standing for regular flag colors (taken from the national flag) in the actual flag. Institución Educativa Malabar originates in an alphabetization center established in March 1970 in Escuela Rufino José Cuervo, located in the Malabar borough, Manizales, Caldas Department. The institute was originally named Colegio de Capacitación Popular Barrio Malabar. The flag of the institute is horizontally divided blue-gray-green. Blue is a symbol of sincerity, cleverness and conscience, representing loyalty, confidence, wisdom, knowledge, truth, integrity, and responsibility. Gray is a symbol of success, stability, creative inspiration, denoting maturity, seriousness, and knowledge. Green is a symbol of growth and hope, representing the youth and balance, also the colour of the natural environment that provides security, stability, and resistance. Instituto Manizales is based in Manizales, Caldas Department. The flag of the institute, as used during the schools' parade held on 7 August 2000 in Manizales, is horizontally divided white-green-red (that is, the flag of Manizales) with the institute's emblem in the middle. Institución Educativa Manuel Germán Cuello Gutiérrez was established in Valledupar (Cesar Department) by Resolution No. 1,269 of 17 June 2002, as the merger of Colegio Manuel Germán Cuello Gutiérrez, Escuela Mixta Villa Castro, and Escuela Mixta Jaime Molina Maestre. The school was established in September 1989 as a contract between Universidad Popular del Cesar and CORINCE (Corporación para el Desarrollo Integral y Social del Cesar), a corporation founded by Alfredo Cuello Dávila, Representative at the Cesar Assembly, and his father, Manuel Germán Cuello. The flag of the institute is described in the institute's Etiquette Guidebook as horizontally divided white-turquoise blue. White is a symbol of purity and peace. Turquoise blue is a symbol of vigour and energy. Institución Educativa Manuel J. del Castillo is located in Ciénaga (Magdalena Department). The flag of the institute is presented in Chapter 5 of the institute's Etiquette Guidebook as horizontally divided blue-white. Blue is a symbol of knowledge, constancy and perseverance. White is a symbol of purity and peace. "Liceo 'Manuel José Caicedo'" was founded in 1949 by Priest Louis Eduardo Pérez Molina in Barbosa, Department of Antioquia. The institute is named after Manuel José Caicedo (1850-1937), first Archbishop of Popayán (1901-1905), and then Archbishop of Medellín (Bishop in 1905, as Cayzedo), who had ordained priest the founder of the institute. The flag of the institute, as shown graphically and described on the website of the institute, is horizontally divided red-white-green. Red stands for energy and vitality. White stands for purity and chastity. Green stands for hope and aspiration to a better future through study. By pure coincidence, this flag is also used, but with proportions 1:2, by the non-related municipality of Barbosa, Department of Santander. Colegio Manuel Mejía Vallejo, located in Envigado (Department of Antioquia), was founded in 1993. The institute is named for the Colombian writer Manuel Mejía Vallejo (1923-1998), founder of the writers' group La Tertulia. The flag of Colegio Manuel Mejía Vallejo, as shown graphically on the institute's website, is horizontally divided blue-white with a gay triangle placed along the hoist and charged with the emblem of the institute. Grey represents firmness, blue represents horizon and mission, white represents spirit. The emblem of Colegio Manuel Mejía Vallejo is a white oval with a blue border charged with the white writing "FORMACIÓ INTEGRAL" (top, Complete education) / "PARA LA NINEZ Y LA JUVENTUD DE HOY" (bottom, For today's children and youth). The oval is filled with a pentagon containing two wheat spikes surmonted by the letters "MMV", all in white bordered blue. The pentagon is flanked by the black writing "COLEGIO" (top) / "MANUEL MEJÍA VALLEJO" (bottom). The spikes are the symbol of fertile growth producing fruits of love and kindness. Institución Educativa Manuela Beltrán originated in a class established in 1954 in borough Manrique Oriental, Medellín, and incorporated, as Escuela Manuela Beltrán, on 28 November 1959 by Decree No. 20. The institute was transformed in 1996 into Colegio Manuela Beltrán. Institución Educativa Manuela Beltrán was established on 27 November 2002 by Departmental Resolution No. 16,188, incorporating Escuela San José. Like several other educational institutes in Colombia, a university included, the institute is named for Manuela Beltrán, considered by the national historiography as the first heroin of emancipation from the Spanish colonial rule. On 16 March 1781, some 2,000 demonstrators rallied in front of the town hall of El Socorro to protest against new taxes established to fund the war against England. Manuela Beltrán,a farmer who sold products on the market, tore into pieces the municipal order that fixed the taxes. The elite of the town set up an alliance with the craftsmen, the merchants and the small landowners and established the Junta del Común; accordingly, the insurrection that broke out and spread all over New Granada was known of the revolt of the Comuneros. Francisco de Miranda, then staying in Europe, recognized Manuela Beltrán's act as decisive for the initiation of the insurrection. There is no other information on Manuela Beltrán - it is not known whether she was executed with the other leaders of the insurrection after its suppression. The flag of I.E. Manuela Beltrán is horizontally divided into three stripes, whose respective width cannot be accurately guessed from the source photo. The upper and lower stripe are royal blue, representing the ability of the human being to overcome difficulties. The upper stripe is charged with three white stars (1 and 2) representing responsibility, honesty, and solidarity expressed by the educational community. The central stripe is white, representing the personal and social peace aspired to by the institute. The stripe is charged with a broad celestial blue strip, itself charged with two thin white stripes near the top and the bottom, respectively. Celestial blue is a symbol of respect as the foundation of coexistence. In the center of the flag is placed a white disk, of diameter equal to the width of the celestial blue stripe, charged with a blue stylized owl representing knowledge and perseverance. In the website of the university reported above they only say that the colors of the flag are white and red and some drawing that is not a flag is shown, suggesting a horizontal divided flag. In <www.umb.edu.co> , there is a picture of the flag and a link to an animated version. This animated version is horizontal white over red, with the emblem. The photograph is from a stand flag but it seems to be diagonal divided, white on the top-hoist and red on the fly-bottom, and includes the emblem (set diagonally so at it looks right in the stand flag). The flag I have seen flying is diagonally divided, with no emblem. Let me confirm, I am pretty sure it is diagonally divided but last time I checked there was no wind (and I was driving) so I am not sure on the disposition of the colors. The Univesidad Manuela Beltrán has its flag already reported. However, I found a variant, which includes the coat of arms, as seen here and here. UMB, a non-profit private university, was established on 29 December 2004 by Resolution of the Ministry of Education No. 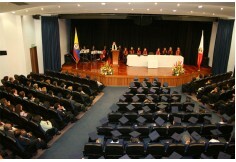 4,974, succeeding the Institución Universitaria recognized in 1992 as the merger of earlier institutes established since 1975. The flag of UMB is diagonally divided white-red by the ascending diagonal. 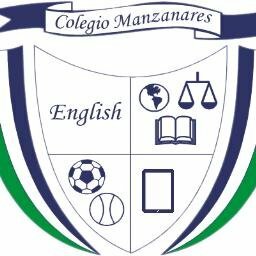 I came across the "Colegio Manzanares" (English: Apple Orchard School) and its flag. It is a horizontal flag, divided into three equal stripes (top blue, middle white and bottom green) according to their logo (https://pbs.twimg.com/profile_images/664134830083416068/EgUnjXnh.jpg). The school is located in Medellín.